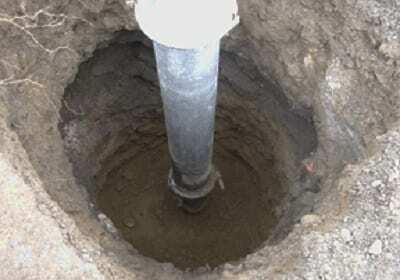 The precision of hydro excavation makes the method ideal for piling hole excavation, which is the digging of holes of varying diameters and depths for all types of pilings. This can be done quickly and safely with hydro excavation. Since hydro excavation is a non-destructive process, underground utilities that may be uncovered during excavation are not harmed, in contrast to the high risk of damage that exists with the use of manual or traditional digging equipment and methods. For piling hole excavation, Super Products’ Mud Dog® Hydro Excavators use a unique combination of pressurized water and an industrial-strength vacuum, combined in one self-contained, mobile unit. Water is pressurized and injected into the ground through a handheld wand (much like a conventional pressure washer) to safely break up soil from the underground area. The resulting slurry of displaced soil and water is then immediately vacuumed from the excavation site through a large debris hose connected to a debris tank in the self-contained, mobile unit, eliminating the need for extra equipment specifically for containment and disposal. Since hydro excavation is a non-destructive process, the risk of damage to buried cables and pipes is virtually eliminated. Hydro excavation is not only faster and more accurate than mechanical or manual excavation, but it also does less damage to the surrounding soil (surrounding soil is virtually undisturbed throughout and after the hydro excavation process) and thus minimizes restoration time and associated expenses.